For Bjørn and Tor’s birthday party we ended up not doing Sculpy Pokemon as Bjørn had originally requested. It would have been impossible to get a big group of seven year olds to sit still and focus for long enough to actually have fun with it. That one works much better in a play-date setting. 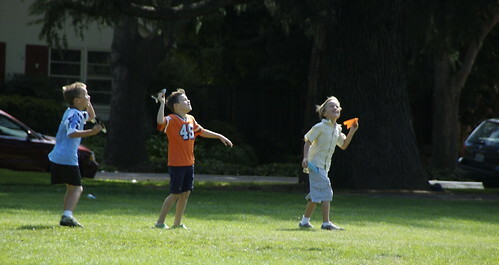 It was ok in the end, because Bjørn decided that what he really wanted to do was to have a paper airplane party. We brought along a ream of brightly colored paper, and two trusty how-to books. The kids had a blast with it, literally spending over an hour with the activity (not bad when you consider that the invite was for a two hour party!). What a fabulous idea! We had a 7-year birthday in our family, too, this year. By request from the Birthday Boy, we folded paper books, and drew pictures in them. I’ll have to keep your idea in mind for next year’s festivities — I’m sure it would be a hit.